Takayo Fischer (Grandma Reiko) started her love for performing, during World War II, when she and her family were forcibly evacuated and relocated to internment camps. Since then she has appeared on stage worldwide, and in numerous films and TV series. She will next be in the upcoming film Moneyball with Brad Pitt and Philip Seymour Hoffman, other feature film credits include Pirates of the Caribbean: At World's End, The Pursuit of Happyness, and Memoirs of a Geisha just to name a few. TV series guest star roles include Eagleheart, ‘Til Death, Weeds, Numb3rs, a recurring role in Boston Legal, The Office, and Medium among others. 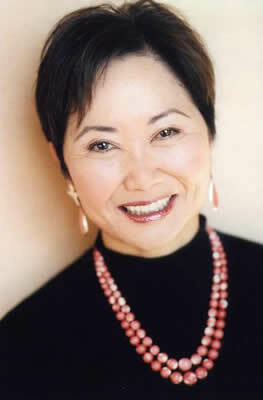 Takayo’ s theater credits include one of her first theatre performances in The World of Suzy Wong with William Shatner, Tea at Manhanttan Theatre Club in NYC (with Lily Mariye), and at the Old Globe Theatre in San Diego. She was in the Peter Sellars international tour of The Peony Pavilion.